Holy cow, but it worked great. In about an hour, the water temperature was a cozy 80 degrees. My tester-in-chief approved of both the design and the lovely warm water. Most sunny days I need to cover the panel mid-morning to keep the tank from becoming super hot — as in 110 degrees (F) and hotter. The great part about this, of course, is that I can just go out and disconnect the system when it’s hot enough; I can’t just turn off the pump, because then the water in the loop turns to steam and the whole business hisses and sputters and scares us all. For a while I ran a bypass loop with a couple of Y-valves and extra hoses, so I could keep the filter going without heating the pool any more, but that just overcomplicated things. These days I’ll take the bucket right out if it’s getting too hot. 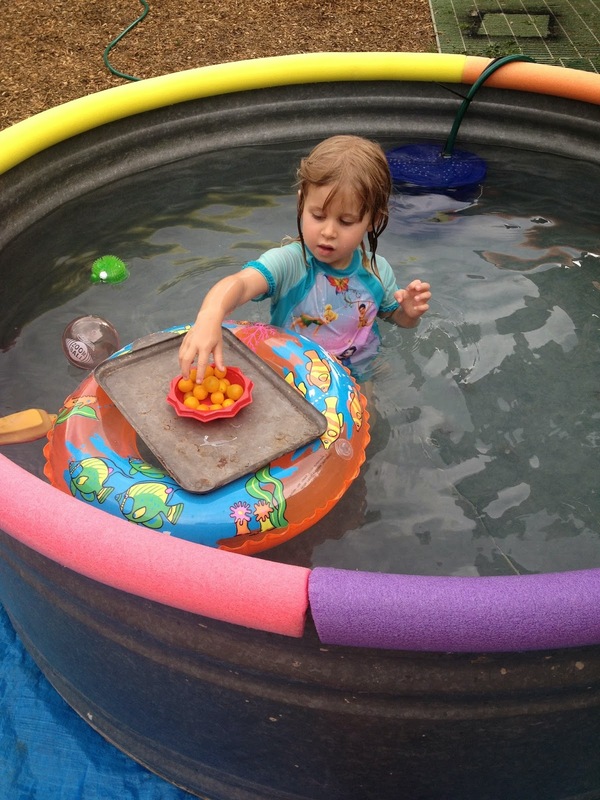 My daughter (and friends) can splash around without kicking the bucket (!) with no problems — when the whole system’s running, there’s no super-hot water involved, it’s all within a degree of what she’s already playing in. It doesn’t heat up suddenly, it takes an hour or two. After the hoses, long run, height raised and everything are taken into account, the pump moves water right around the panel's recommended 1.5 gallons per minute. Very efficient. 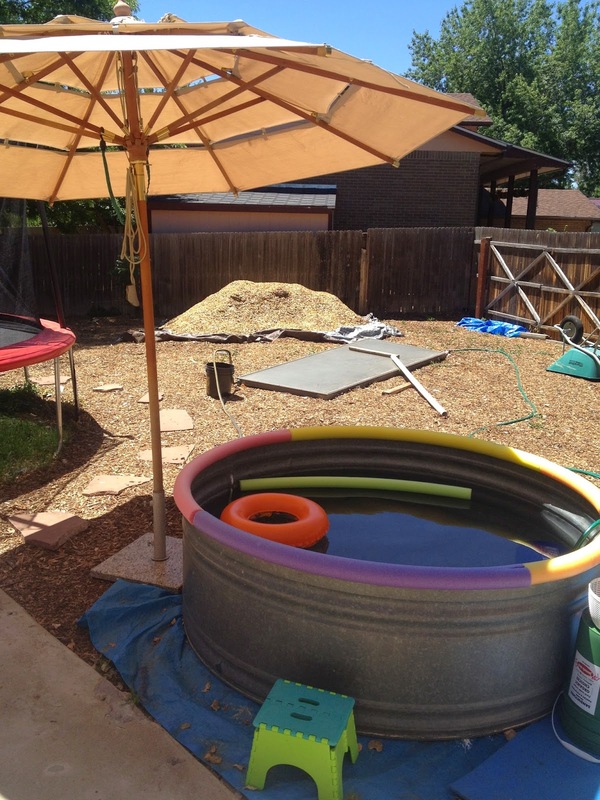 But what the system’s done most of all is seriously increase the use of a kiddy pool. Even partly cloudy days generate enough solar gain to warm the thing up by noon, and on sunny, windy days when getting in and out (as kids do) is sort of rough, having the option to go up to bathtub temperatures at no significant increased cost or hassle is a neat deal. To say nothing of getting up to hot tub levels for a post-sunset grown-up soak under the stars. Additional amenities eventually included a step stool, an umbrella (Craigslist free section), and my high-tech leaf skimming apparatus. 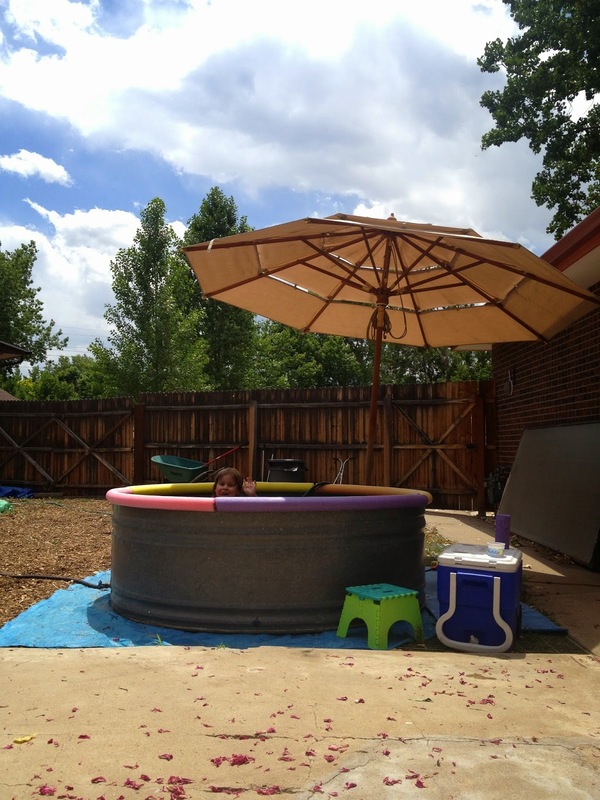 For my daughter’s age, the solar stock tank swimming pool is perfect. Pool parties are awesome. My custom tomato delivery system got rave reviews locally, at least. She liked it. On a hot day, under the umbrella, falling asleep just happens. And, because you’ve read this far, enjoy a little unbridled cuteness. Eagle-eyed readers will spot the other solar panel and salvaged deck lumber that eventually became part of the treehouse in the background. Dude that is awesome, inspiring actually. I have always wanted to do just the same thing. Quite surprising just how much it was able to heat up the water. I wonder if perhaps using maybe one more panel you could somehow create underfloor heating in a home. Hmmm, thank you! 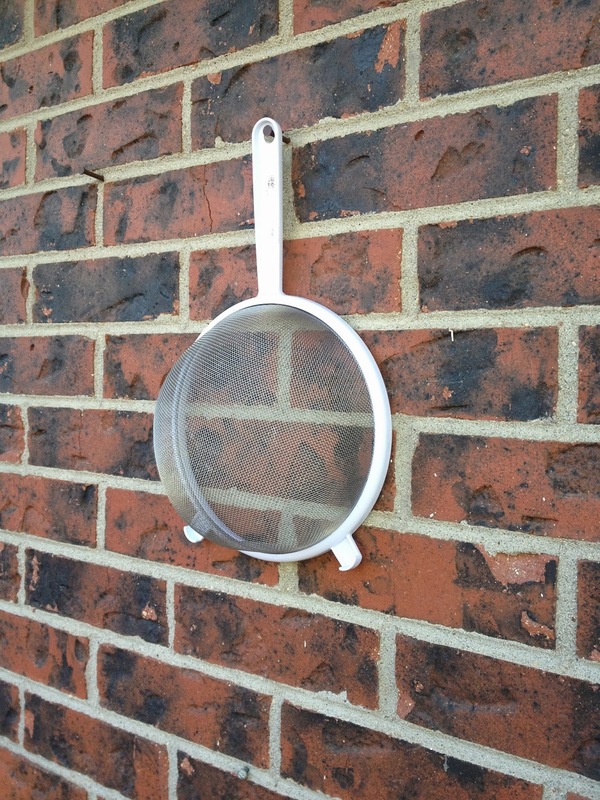 Have a friend that did one with a small kindling fire at the bottom/side for adult soaks.